CRYPTO CRASH - WHICH WAY FROM HERE? The threat of a regulatory crackdown triggered a selloff in cryptocurrency prices in late January. I noticed that when it really crashed down (with all the markets) in early Feb., it began when several negative comments were made at Davos where the elite were meeting. After bitcoin briefly dipped to around $6,000 in early February, regulators' comments in several countries were positive for the market, helping to drive the digital currency back well above the $11,000 level. Swiss regulators issued a set of guidelines for initial coin offerings, which called for treating them as securities, further legitimizing them. Singapore's top regulator indicated the government sees no systemic risk from cryptocurrencies and thus no need to ban trading in them. In the U.S., the White House's top cybersecurity official echoed the position of the nation's two top financial regulators that there needed to be more understanding of digital currencies before the establishment of a regulatory framework. Even South Korea appeared to back off from any draconian measures, with reports indicating the government is now considering a licensing system for cryptocurrency exchanges instead of a ban. In general, regulators appear more concerned about the use of cryptocurrencies in illegal activities, such as money laundering, and establishing investor protections, than limiting or banning the use of digital currencies. Many of those same people who spoke so negatively at Davos are meeting this weekend (Sat.-Tue.) in Argentina for the G20 meeting, where some want to find a global consensus on regulating the cryptosphere. As this weekend's meeting began to draw closer, more doom and gloom "news" statements by a few Finance ministers began coming out over the past weeks, which seems again to have been the driving factor to the downside across the board these last several weeks. Thus, it is my view (not financial advice) that a large number of people and especially whales are sitting on the sidelines awaiting word out of this G20 meeting. And I wouldn't be surprised if some pushing the latest over-driven negative narrative through the media of late are loading up on crypto at rock bottom prices, while so many are waiting for some positive catalyst, or at least neutral news, to start really jumping back in. We are already beginning to see some rays of positive news on smaller scales begin to appear to stabilize the market some today. In my view (not as any financial advice), given so many central banks and nations are now looking into developing their own centralized cryptocurrencies, along with the other more positive regulatory news in February, I believe the odds are still in our favor of seeing another growth wave for the rest of 2018, which could even be much like the one we saw last year. In these times of FUD (Fear, Uncertainty and Doubt) if we can just step back for a moment from the sometimes torrid emotions and put things into perspective and remember the fundamentals of the entire cryptosphere, especially those we believe in the most, it's a great buying opportunity right now to get in at decent prices. For anyone who remembers the feeling of wishing they had invested more into it when bitcoin spiked up past the 10k level for the first time and on to 20k in a matter of a month or so. Who remembers that euphoria then? Well, that is where the price is at now again. It is like turning back the clock to mid November just before that mega spike all over again. So even if it drops a bit more from here or not, given the general momentum and all that is happening in this new market, in 6 months or a year from now it will most likely be way up higher than now. 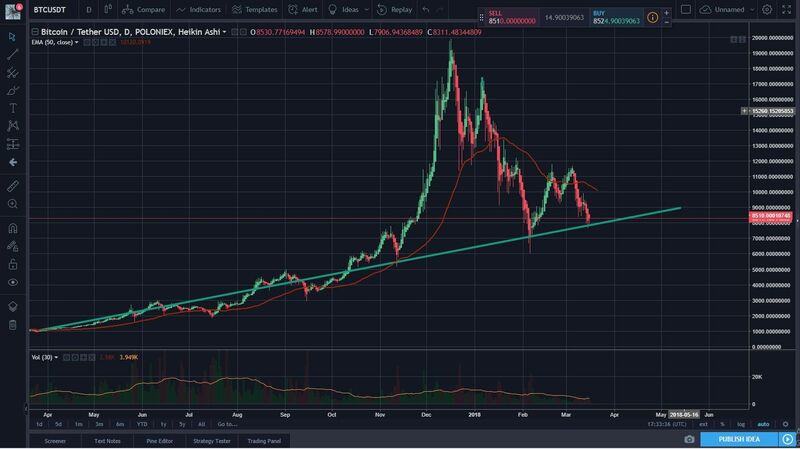 If you look at the rising yearly support trend-line in the chart above, where we are at now, it shows specifically that yesterday it dove down to just barely touch below it around $7,600, depending on the exchange, and has been slowly bouncing back up to where it is at the time of this publication (i.e. just above $8,500). While it may go back down to test that support again, especially over the next 4 days, the odds are that, baring any real negative news out of the G20 meetings, we will have seen a bottom base set to begin another climb off of back up, which could very well head into fresh new ATHs (All Time Highs) for bitcoin and many of the other cryptocurrencies in the next several months. Even if it breaks the support line, the odds are that will be short-lived before returning back above. You can open a cryptotrading account on Binance. 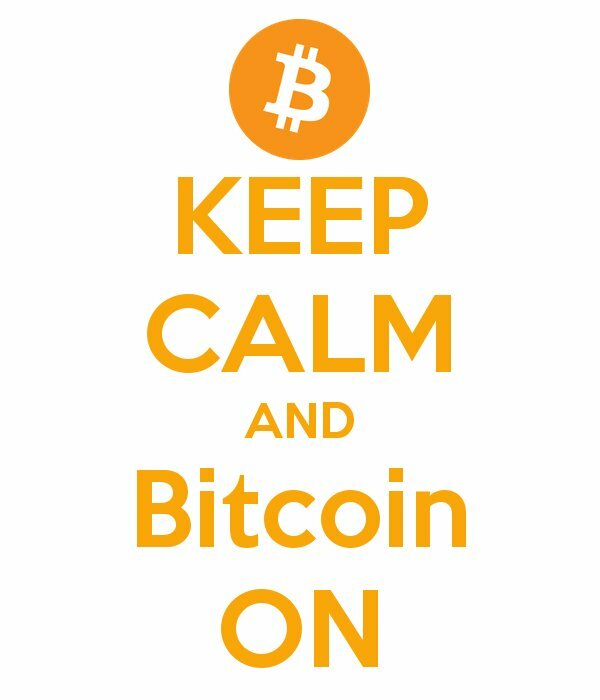 You can also purchase Bitcoin, Ethereum, Litecoin or Bitcoin Cash on Coinbase using this link and receive $10 in bitcoin once you purchase your first $100 worth. This is not financial advice, but I thought I might share some of my research, thoughts and ideas on this new blockchain technologic revolution. Thanks, @honarparvar :) I just commented there... Have a great weekend! About "the rising yearly support trend-line" in the chart, I have an opinion: crypto charts and markets shouldn't be analyzed before 2017! Overall, I tend to agree with you to a certain degree, but despite the relatively low volume and some really wild swings sometimes out of the trend lines then, I still have noticed statistically the general trend lines even then tend to hold their weight as the best general TA indicator on odds of crypto charts. Of course, this chart still is 2017/2018 on bitcoin.